Since joining Tom Farms in 2005, Kris has driven numerous projects to help serve the company and develop its strategic growth, including the development and expansion of CereServ, a 2.2 million bushel grain facility (CereServ, Inc.) where he currently acts as the companies Secretary. He also works in conjunction with numerous precision agriculture companies consulting and implementing technology on the farm. 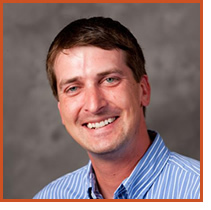 Kris holds a bachelor’s degree in Agricultural Economics from Purdue University and is a graduate of the Executive Program for Agriculture Producers. He also serves as an independent consultant for ag. technology companies. Kris grew up in Kosciusko County and currently resides in Leesburg. In his spare time, he enjoys outdoor activities such as golf and mountain biking as well as spending time with his dog Maggie, an Australian Shepherd. Prior to working at Tom Farms, he worked at Alderfer Bergen & Company, a local investment firm and Josef Bruck, GmbH, an agriculture retailer and grain facility with five locations located throughout Austria.